VyprVPN claimed to be the most powerful VPN but we believe there’s a more important piece to share. The independent 3rd party audit from a security firm. “The World’s Most Powerful VPN” VyprVPN used to claim a high status in the world of private web browsing. Now they’ve rebranded to “The World’s Most Trusted VPN” and they certainly have a right to claim that title. Golden Frog, the company behind VyprVPN, is based in Switzerland (a country that takes data and internet privacy very seriously). Let’s take a deep dive into VyprVPN in our review, and see how they stack up against other VPNs. 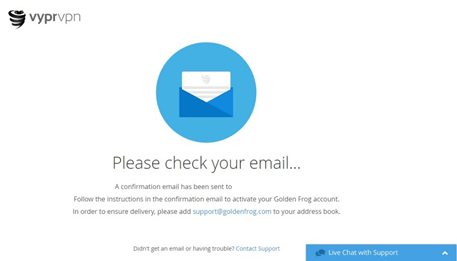 It’s also important to mention a few things about Golden Frog as an internet optimization company. Its founder is known for committing to developing software that enhances the web usability making it more open and secure, but at the same time, respecting the privacy of the users. Let’s get this bit out in the open first. VyprVPN is quickly becoming a very trustworthy service by publishing the independent audit report by the security firm Leviathan. Not only did they welcome the security firm to run a full diagnostic on their VPN architecture, but they also went on to publish the entire report to the public to see. This move is clearly the right step to take for any VPN company and VyprVPN is leading the pack. The audit showed where logging issues were and these issues have been quickly fixed. In terms of trust and transparency, VyprVPN is certainly one of the more trustworthy VPN services now. Servers and Locations – Is 700 Servers Enough For You? VyprVPN offers more than 700 servers across 70 countries. There’re over 200,000 unique IP addresses available. There’s no need to beat around the bush; Vypr offers a stunning amount of choice, and is definitively one of the top performers in this category. At the time of this VyprVPN review, our internet speed was operating at 300Mbps download and 300Mbps upload. We tested from Northern Europe. 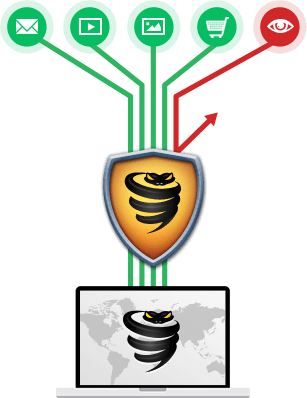 The company owns and manages their own server clusters, which is a great plus for customer’s data security. That means no 3rd parties; their code, their hardware, their network. What does this mean for you? Golden Frog retains and owns all the data within their VPN client, and no third party can access this information. Even better, Golden Frog also offers their own DNS called VyprDNS. What this all adds up to is one very secure VPN. Privacy fans will love to hear that Vypr is a Zero-Knowledge DNS, with no logging whatsoever. So your activities stay anonymous! Netflix has started to block VPNs more aggressively to restrict location-based content. Most VPNs simply can’t get around this. Some can; and some, can every so often. VyprVPN is one of the latter. While VyprVPN isn’t perfect, some servers are still able to pass the Netflix test. We tested the New York and Chicago servers for Netflix streaming, and VyprVPN passed with flying colors. As of January 2019, VyprVPN also works for Netflix UK regions as well. Netflix still seems to not work for some EU servers. Still, having access to US and UK Netflix content is a major plus. This essentially means you will be able to watch most TV shows and movies offered in English by Netflix. VyprVPN also offers a unique VPN traffic channel, the “Chameleon Protocol,” allowing you to escape country restrictions and censorship. It encrypts and scrambles your data so you’re able to browse securely and safely. This is a protocol unique to VyprVPN, and should be effective in getting around geo-restrictions and limits such as those set by Netflix. However, you can only use Chameleon if you opt for the higher tier package offered by VyprVPN. For an extra $1.67 a month, it’s worth it – you’ll also get other extras. Kill Switch: Activated and Engaged, Commander! 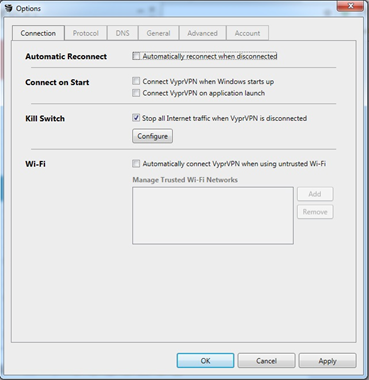 VyprVPN offers a kill switch feature in case you are disconnected from the VPN. It’s configured in a way that it stops all Internet traffic when VyprVPN loses connection for whatever reason. We’re very happy to see this included. VyprVPN’s Pricing Has Some Caveats, But It’s Affordable. VyprVPN: $5 per month billed annually (-50% discount, $60 per year), or $9.95/mo billed monthly ($120 per year) for 3 devices. VyprVPN Premium: $6.67 per month billed annually (-50% discount, $80 per year), or $12.95/mo billed monthly ($155 per year) for 5 devices. Everyone is aware of annual vs monthly billing, but it’s quite a significant discount for signing up for the year. 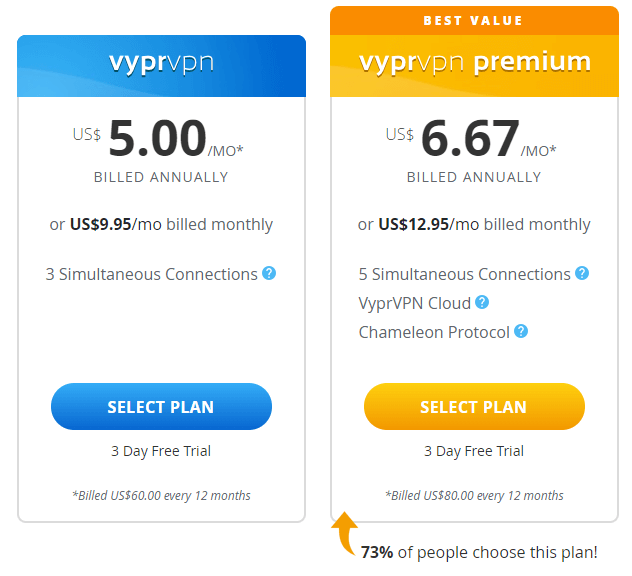 $5 is usually the settling point for many VPN buyers, but for 73% of Golden Frog’s customers, it makes sense to get the VyprVPN Premium package for $6.67. Because the basic option doesn’t include the Chameleon Protocol. That likely means you’re stuck if you want to get past geo-restrictions and the standard protocols aren’t working. On top of that, you don’t get your own dedicated cloud VPN server. The two additional device usage is a nice bonus as well. All that said, we’d certainly recommend customers spring for the slightly higher but more feature-packed $6.67 plan. PPTP – basic 128-bit encryption which is slightly faster due to a weaker encryption, and useful if your device doesn’t support OpenVPN. L2TP/IPsec – 256-bit encryption which is obviously a better security choice than PPTP. OpenVPN – available in 160-bit and 256-bit, OpenVPN is one of the most trusted protocols widely used by the majority of the VPN community. Chameleon – proprietary technology which also gets around deep packet inspections, so you can get around country restrictions. The Chameleon protocol is only offered to premium customers. On top of these protocols, a Network Address Translation (NAT) Firewall is also available. You will not find yourself experiencing compatibility issues, when using VyprVPN. It works with all major devices, whether you’re using a Windows, Linux, Mac, Android or iOS device. Do keep in mind that VyprVPN doesn’t support TOR browsers, however. 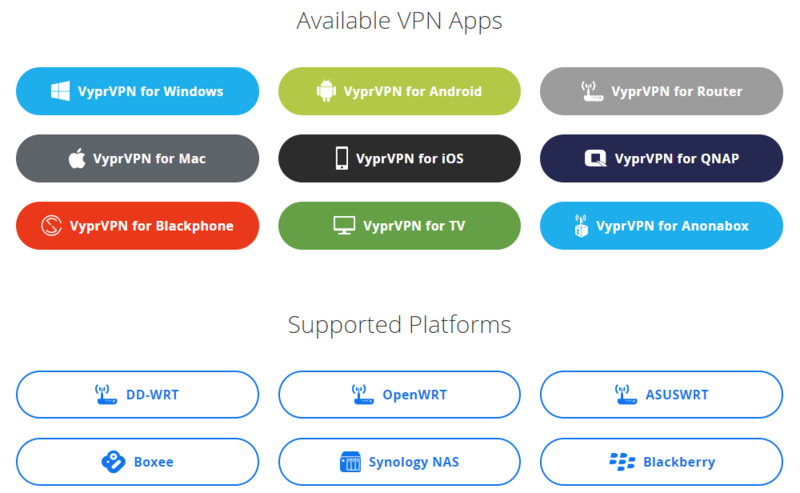 VyprVPN does offer bonus features, by allowing you to anonymize your TV (Android and Apple), as well as your router – handy features to include. Sadly for those who enjoy the utility of browser extensions, VyprVPN offers none. Just visit their website, select the plan that suits you the most, fill out a simple form and get the following confirmation email in your inbox. After that, you will see a brief introduction on what the service looks like and how you can set it up on your computer. In case you have another device, don’t fret. 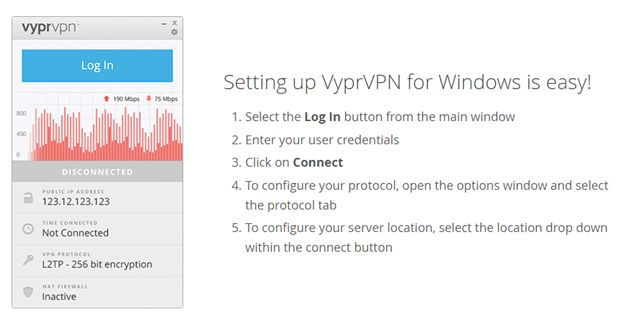 VyprVPN offers plenty of tutorials on setting their VPN up on other devices also. 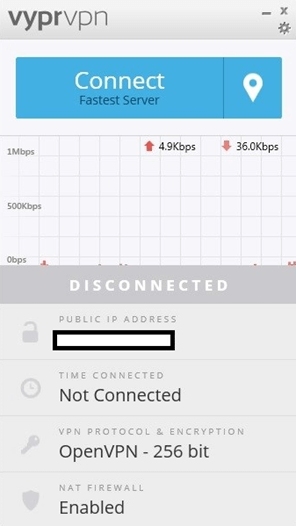 VyprVPN’s UI is slick, simple and very easy to use. You have all the necessary information on the main screen that pops up on logging in. If you need to adjust the settings, you simply click the “cog” button to get to what you need. Right after you click the settings button, head to the “Option” menu to have a look around. There are four protocols you can choose from, one of which is the unique Chameleon protocol VyprVPN offers. You’ll be using OpenVPN by default when you start, so if you want to change, this is where you’ll need to do so. You can choose any server you like, simply by pressing the button with the location sign right next to “Connect”. Here you will find a drop-down menu with locations and approximate ping readouts for each server. Vypr has made it easy to sort the list, with sorting By Region, Favorites and Search; alternatively, you can hit All and browse through the tremendous list of servers on offer. 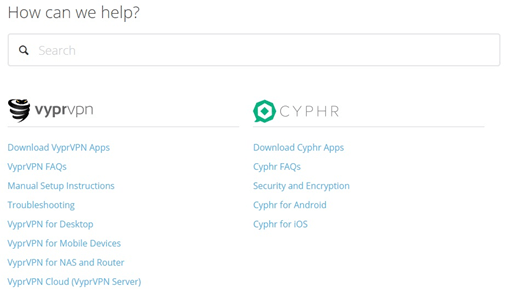 The settings area will also provide help you if you ever need customer support, want to seek help on forums, check what apps are available, as well as options to purchase VyprVPN for business purposes, should you need it. You can access the FAQ section right from the Options within the desktop app. It has an impressive range of common questions and extensive guides on how to run and install the software on different operating systems and devices: Windows, Mac, Android, etc. Sad news for Bitcoin holders. You can’t pay for the software anonymously with cryptocurrency. You can pay for VyprVPN with your credit card, Alipay or PayPal however. VyprVPN offers a 30-day money-back guarantee period for each plan. You can cancel your plan mid-term, but you won’t get any refunds for your unused months. And yes, there is a 3 day free trial offered, in case you want to try before you buy. You Can Torrent; Download Responsibly! You won’t find any restrictions on torrenting or P2P file sharing in Vypr’s user agreement. They even go as far as to say that they treat all traffic equally and do not put any restrictions on your actions in regards to torrenting. However, like most VPN providers, they have a note specifying their stance on illegal downloads under copyright laws. If you’re planning to do plenty of questionable torrenting, bear in mind you’ll be going against their ToS should you download content illegally. Although VyprVPN does not monitor the content of your traffic, you are not allowed to break your local copyright law. If your account gets suspended because of a copyright infringement notice, it’s on you. You won’t get your money back either. The main point to consider is that you are allowed to torrent files, but keep your local copyright law in mind. We’ve seen user reviews say their account was suspended due to this reason, but it’s not too frequent. Your luck may vary. Be careful. Although you’ll find this reassuring “Live Chat with Support” button on the homepage, it’s actually a ticket system; a bit of a cop-out. 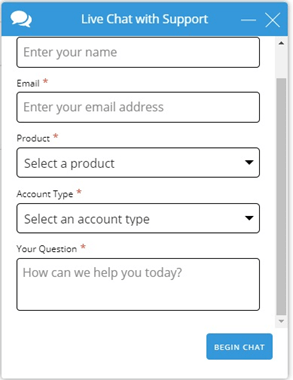 Filling out the form and entering your email, VyprVPN staff will answer your questions, but not immediately. VyprVPN’s customer support, though responsive, takes a little bit of time to resolve customer issues. We remember the early days of Golden Frog’s customer service, and Vypr’s response times are a huge improvement. That doesn’t mean it’s all sunshine and rainbows; users have reported more than 10 hours of waiting time to get an answer to their problems. That said, you can typically expect an answer in 10 minutes to 1 hour. Be prepared to provide plenty of information on your problem – it’s unlikely the customer support staff will be able to solve your problem right away. Golden Frog GmbH operates as a “Global Internet Privacy and Security Solutions” company. What this means is they make products that protect you and aims to increase your performance. Based in Switzerland, they operate with a privacy-driven legal framework. They take privacy seriously and are clearly leagues ahead compared to most VPN services. This was one of the biggest concerns privacy-seekers used to have with VyprVPN. VyprVPN used to store sessions data for up to 30 days. And they were very clear about this policy too. They let users know which data was stored: connection start and stop times, total number of bytes used, and all the IP addresses used by the user. This meant your IP was not fully hidden – a deal-breaker for some customers. This is no longer an issue since they published an independent 3rd party audit from a security firm. Golden Frog was transparent from the start about their logging policy and still remains transparent. We, as consumers, must rely on trusted third party information – court cases (as proven twice by Private Internet Access) and audits by security companies. If privacy is your primary concern, VyprVPN should win massive points – your personal data is anonymous and safe, at least according to Leviathan Security Group. Conclusion – Is Transparency Important to You? VyprVPN is a great piece of software, that most users will find extremely comfortable and easy to use. It has a very nice intuitive user-interface, and plenty of things to be satisfied with – Swiss jurisdiction, respect for user’s privacy, avoiding geo-restrictions with Chameleon protocol, and the ability to stream Netflix in US and UK. That’s all great, but they also discourage torrenting and don’t have anonymous payment options. 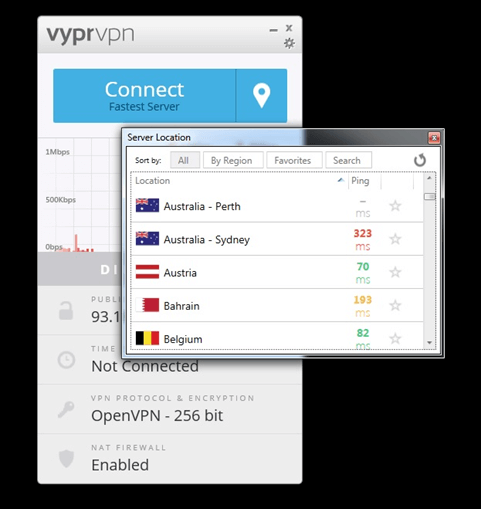 Overall, VyprVPN is a high-performing, fast and secure VPN for almost any device. Our recommendation for VyprVPN boils down to what you’re looking for from a VPN. Looking for ways to bypass geo-limits and want to keep your internet traffic anonymous while browsing? How about trust in the company that handles all your sensitive information? If VyprVPN as a product sounds interesting and you believe company transparency is important, click on the link below to try VyprVPN. + Chameleon mode provides a safety net for your browsing needs. + Netflix streaming on limited servers. 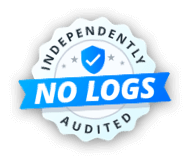 + No log audited by security firm. - Short free trial period of 3 days. - No anonymous payment options.